SMALL KUCING: Time for KFC-Kampung Food court? Dinner time. We were at KFC last month. Don't believe? 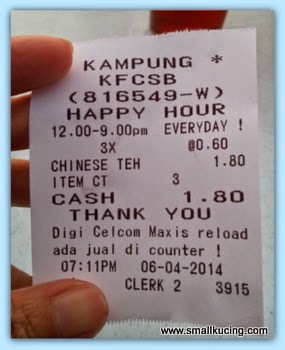 Nah....KFCSB - Kampung Food Court Sdn Bhd . What's good here? Err...dunno,.....first time cari makan around here. But after she ate...she said not bad leh.The soup tasted good . Not spicy enough so she pour in the small plate of sambal . Yum yum...baru best. 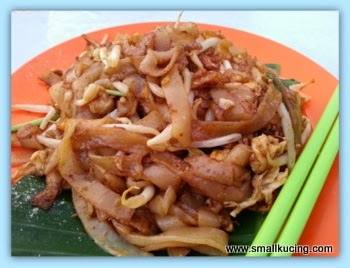 Duck Egg Char Keoy Teow. Slurp slurp......quality controller at work. 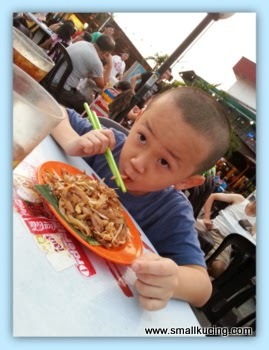 Mmm.....Good....sedap.....Papa also said sedap. No wonder so many people order the CKT. 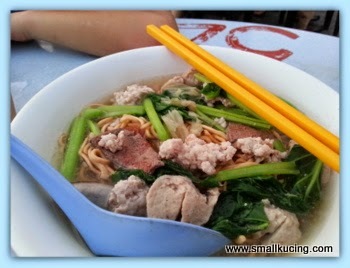 My bowl of Pork noodle. Guai guai wait while Mamarazzi snap photo first. Ah?? so much liu...where is my noodles....next time I wanna tell them gimme the noodle only la. Something to munch while waiting for our food. This food court seems to have a lot of good food to offer. Saw there is a Wantan Mee stall which the Lady Boss too busy to rest. Many people order from her. Next time must try out. Looking at all your pictures, I really though this was KFC!! And I thought, WHAT is going on, there is NO chicken!! This is not like ours! Then I had to scroll back to the top and saw the joke! 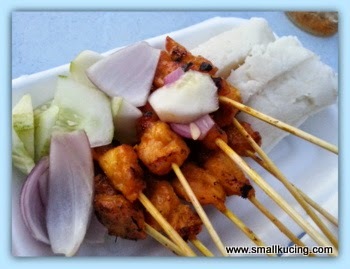 Morning today tuk-tuk-ing from phone.. Eh I also like duck egg ckt, more 'heong'.. 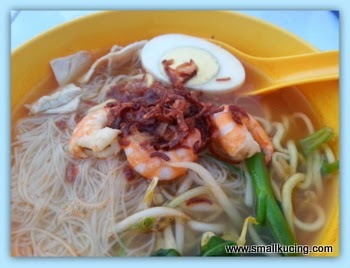 I can eat BIG one, ckt campur mee, double telur.. Best giler..
Yep on first look the prawn mee looks macam pale wor but I know sometimes cannot judge like that la.. Mamarazzi say taste ok wor.. 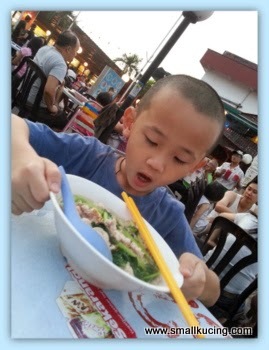 So must be ok la tu..
Yummm same as J, I like pork mee too.. Will usually order 1 bowl of pork mee, tambah one additional bowl of liew only (without mee).. Ooohh and more chue yau char pls! Yeah hard to get duck eggs CKT here. haha funny lah KFC stands for Kampung Food Court, errr, I wonder if KFC has got this three letters patented or copyrighted?? there is also one HSBC in Bangsar, and it stands for Hot & Spicy Bangsar Curryhouse, hehe!! 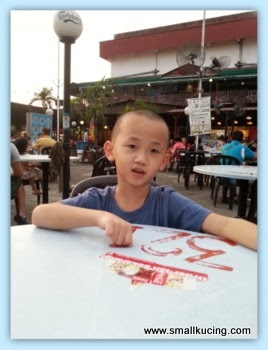 eih, though Klang is too far away for Uncle SK but then who knows, we never know one day he may also go there right?? and go hunting for the KFC hawker food.. looks like a nice place to go..
That pork mee is so tempting. 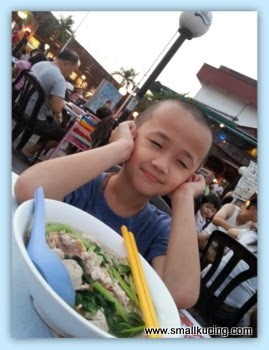 Wantan Mee??? Is my favorite leh!!! Duck egg ckt looks good. 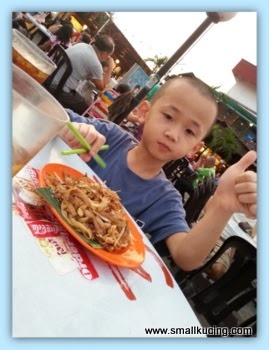 Small kuching so good to help mamarazzi order prawn noodle. Good boy! Wah ...This small, kucing ate so much good food ! Nice discovery ! hahaha!!! you're such a good boy, smallkucing to patiently wait for mamarazzi to finish snapping pics (: and so happy, too! haha. usually when i have to do it.. a lot of people have black faces.